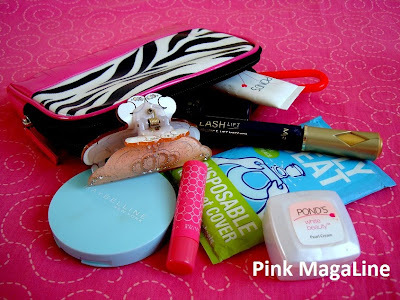 Every girl needs a vanity kit, that tiny purse to keep some cosmetics and other toiletries for personal grooming. Call it a beauty bag, kikay kit or powder bag, it is all we need to look and feel fresh while on the go. 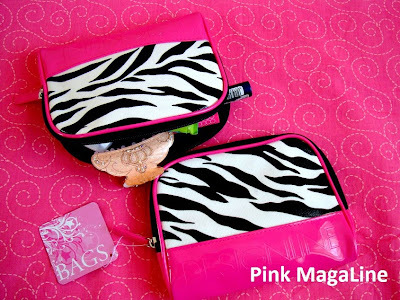 Take a peek of my new pink powder bag here. The items that I have inside are listed below. I bought this really cute vanity kit from a nearby mall. It was actually love at first sight. The combination of pink and the animal print is just so cute, so I purchased two of them. One for me and one for you! Wait what? Oh yeah, I said it right. I am giving away the other to a one lucky reader. 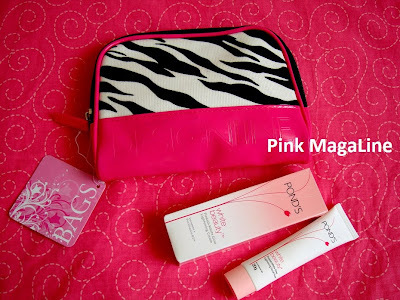 Enter for a chance to win this pink vanity bag together with two of my favorite Pond's products: facial cream and facial foam. This giveaway is open internationally. Just leave a comment on this post sharing something about the beauty product that you can't live without. Don't forget to follow this blog in case you're not a follower yet. Being a follower makes your comment a valid entry. Not a Blogger? No Open ID but wants to join? Simply repost the url of this giveaway through your facebook account, then tag me or send me a facebook message, so I can validate your entry. Deadline to enter is Friday, July 16. 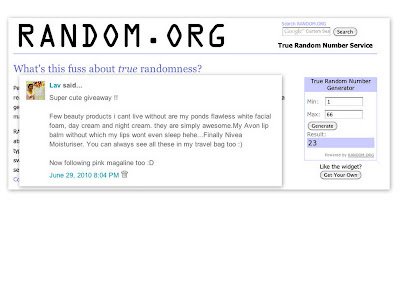 The winner will be chosen through random.org and announced the next day here on this very same post. The winner will be given only 72 hours or 3 days to respond or else I'll have to pick another winner. Sorry, time is up girls! Congratulations LAV! My gosh i love to have this kit, so fab and kinda tempting.. I think the beauty product that I can't live without is collagen facial wash.. or maybe my magic cream, paubos na kasi kaya magpapabili nako sa sis ko. I tried alot of different creams pero pinaka nagustuhan ko lang yung magic cream..
Goodluck to me and to other participants.. Required din ba i-blog ito? Thanks again Ateh for the chance, happy birthday uli. Tapos na ba? Lol! Shinare ko na rin sa blog ko, mas madami mas masaya! The vanity bag alone made your contest worth joining! Ang pretty! :D Love it! Beauty product that I can't live without? Isa lang? Hirap naman. Haha. Pero I say it's VMV Armada w/ Spf60, it's lightening + suncreen in one. Hi sis, soo Pinktabulous naman ng bag, i love it! Cge, fave beauty product can't live without? Sabon! heheh! - Safeguard... hehehe! Wow! love ko din to sis.. I'm also joining your lovely give away. I am a now a follower of your blog too. Beauty Product I can't live without? I have a pale lips and an oily face so obviously I can't live without my pink lipstick and face powder. -Missha Concealer(I always carry it because I use it when I need some touch ups in my face). Hi, I would love to join! Beauty product I can't live without? Is my nichido powder plus foundation in Tender Honey. I've had this product since 2006 and it has never failed me yet. I have a normal to oily skin and my nose would always look shiny whenever and this product is perfect for me. Thanks for the chance to win this great bag! I can't live without my Maybelline foundation to cover up all my facial flaws. Gosh! These products are beautiful... I hope I will be lucky enough to have it. Enter me in this giveaway please! The beauty product I can't live without is my Rimmel Colourstay Listick in mauve. It keeps my lips soft and moist! Hi girl! I just saw your blog...ang cute huh! Can I join? hehe! * lip balm ( maybelline,nivea cherry & angel star). It moisturizes and adds color to my lips...so I don't need to wear lipstick! It's cheaper too! hehe! * Maybelline face powder. ( It keeps my face smooth and always looking fresh)! wow..cute pink bag..i love it..makikisali rin ako sis ha..i am ur new follower..it's my first visit here..
-red lipstick (maybelline, secret, revlon), because when I don't wear it, I feel do not have self-esteem. Red lipstick would make me feel more confident. Red lipstick also will makes my lips looks flushed and flushed my lips. because it can help my skin protect itself enough than an effective wrinkle can finish the job. It also can keep my skin functioning the best. Also keeping my skin soft and moist. I cant live without mark That's Deep Purifying Gel Cleanser! Can't live without my lip balm, moisturizer with SPF and toner! Hi dearie! I just followed your new chic blog. And to answer your question: I can't live without my trusty Blistex Lip Balm. I'm so prone to dry lips because of Baguio's cool weather. I cannot live without Body Shop lipbalms, Korres tinted moisturiser and mascara. The beauty product that I can't live without is lipstick, no particular brand but preferably those with SPFs & vitamins will do. Hi! This is the first time I am joining your contest since I am just a new follower, I just hope I have what they call the "beginner's or first timer's luck"! :-) The prize are really cute! Well, i can't live without Olay Total Effects facial wash and cream. I love its mild scent, its mild effect on my skin as in no sting! It helps in softening my skin. Hi there! The vanity case is oh-so cute!! Definitely joining this giveaway! I love the color of the kikay kit so I'm gonna join! I'm a follower already and the beauty product I can't live without is lipgloss of Agnes B and moisturizer of Cosmence. Nice vanity bag. I like the color. And Pond's! I always use their facial foam. These are hands-down the best tweezers you can get. If you’re trying to avoid the Sasquatch look, I suggest you buy yourself some right away. I love this mascara. It has a fabulous brush and it never clumps. This is a fantastic moisturizer for my very dry skin (especially in the winter) – totally non-greasy and lasts forever. My must have is Dr LeWinn's Puressence Day Fluid, a perfectly light moisturiser that keeps my skin supple and clear. Beauty product I can't live without? Only one? I think it would be MOISTURIZER! I'm currently using Olay Complete for Sensitive Skin. I have 3 products I can't live without - lipbalm to moisturize my lips, a moisturizer for my face and a body lotion to keep my skin soft. My favorite beauty products are sunscreen and aloe. It doesn't matter how much I put on or how often, I always get red. Thanks for your comment in my blog, I'm so glad. And I can't live without my bronzer, every single day. I can't live without my YSL touche eclat. It's perfect for everyday! beauty product i can't live without is my maybelline clear smooth powder.. I can absolutely not live without my foundation! Blotchy skin, dry, freckles, it's nice to know I can hide it all behind a thin layer of powder! I can't live without a eyeliner!!! hey there! i am a follower :) love the cute banity kit! very very cute! i actually have a few items of the same kind that i cant live without. i love my Maybelline eye pencils which come in the brightest of colours. they add immediate pop to my eyes! Hi! I am your new follower! I found this giveaway when I`m crossing on International Giveaway site. Hope I do win! The beauty product I can't live without is ELF mineral infused face primer, it helps my foundation last longer. I want to enter! The vanity kit is stunning.. I LOVE zebra print and pink!! The beauty product I can't live without.. Well, I have to say mascara. (my favourite is Max Factor False Lash Effect, though at the moment I'm not using it but some other..) Even though I love wearing colourful eyeshadows, without mascara I couldn't go anywhere. I cant live without pressed powder cause i have a very oily skin, i need powder to look normal. lol.